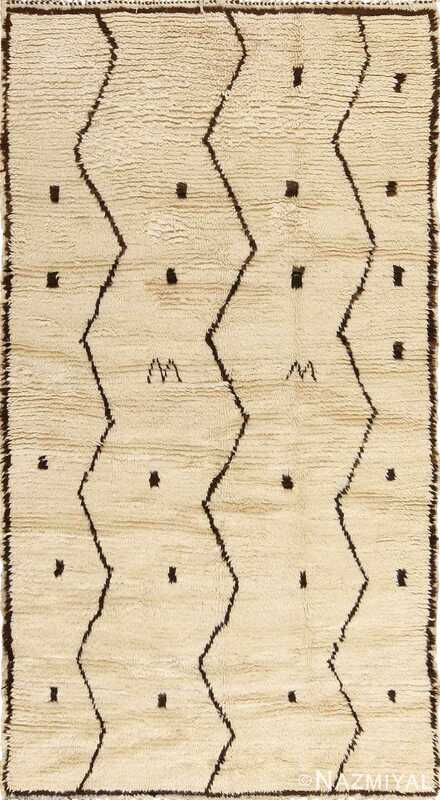 Beautiful And Tribal Small Vintage Moroccan Beni Ourain Rug , Country of Origin / Rug Type: Morocco, Circa Date: Mid – 20th Century – This abstract tribal Moroccan Beni Ourain rug has a whimsical appeal and primitive feel that will add charm to any home decor scheme. 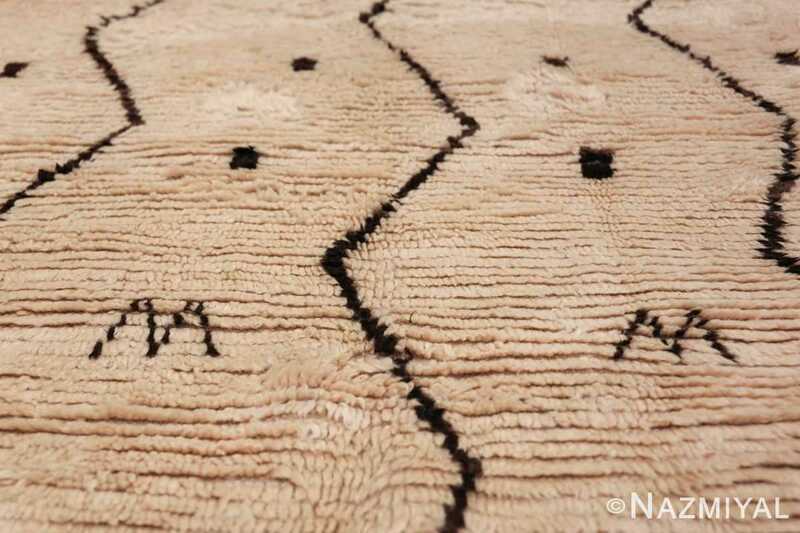 The majority of the Moroccan rugs of this type were produced during the middle part of the 20th century and became an important staple in the interior design landscape. 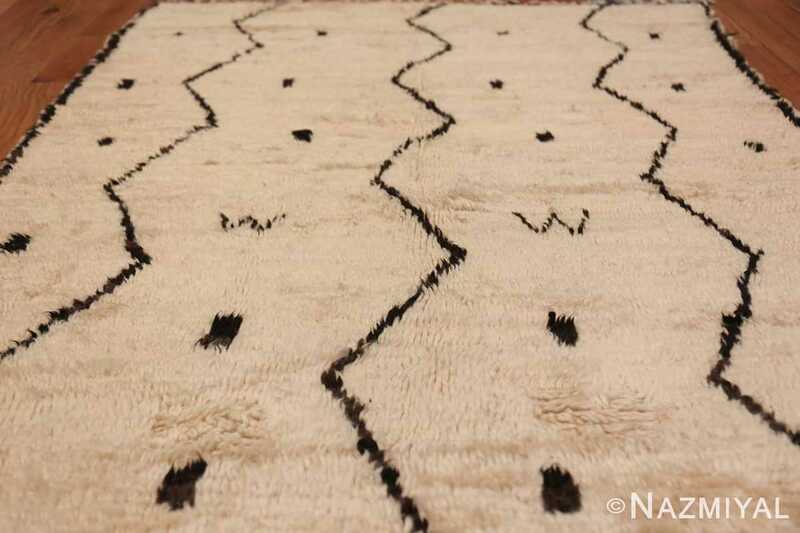 These beautiful rugs from Morocco are similar to many of the abstract paintings and pieces that were being produced by contemporary artists of the time. 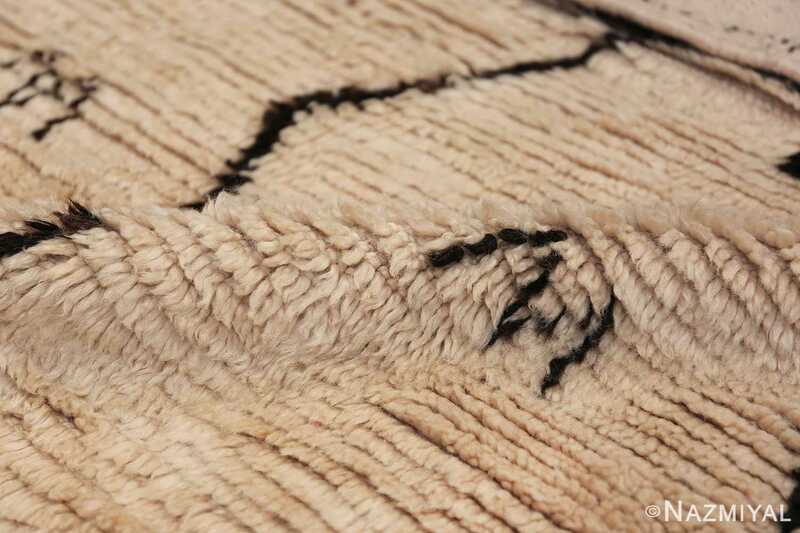 They may be a vintage piece, but they still hold up to modern design ideas. 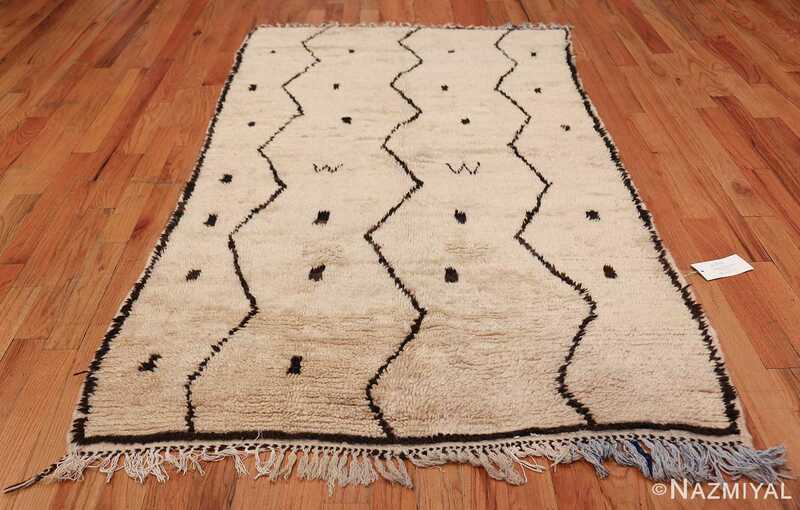 Part of the fascinating aspect and beauty of these Berber rugs is that they incorporate symbols that were derived from the ancient Berber tattoo designs. As a result, there may actually be far more meaning in the patterns themselves then one would think. For those that can crack this ancient code, these magnificent vintage rugs tell an actual story. This gives them an even deeper artistic meaning. 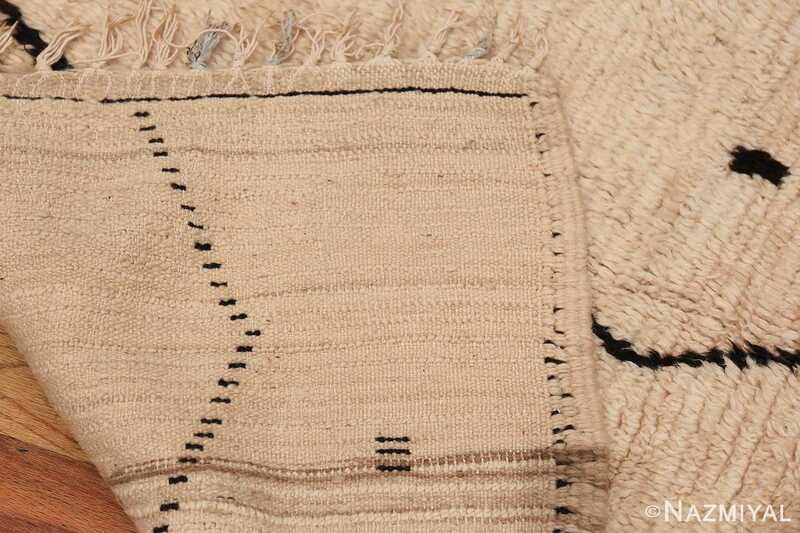 This small vintage Moroccan Beni Ourain rug uses a chocolate brown wool to create the design that is juxtaposed against an ivory background. 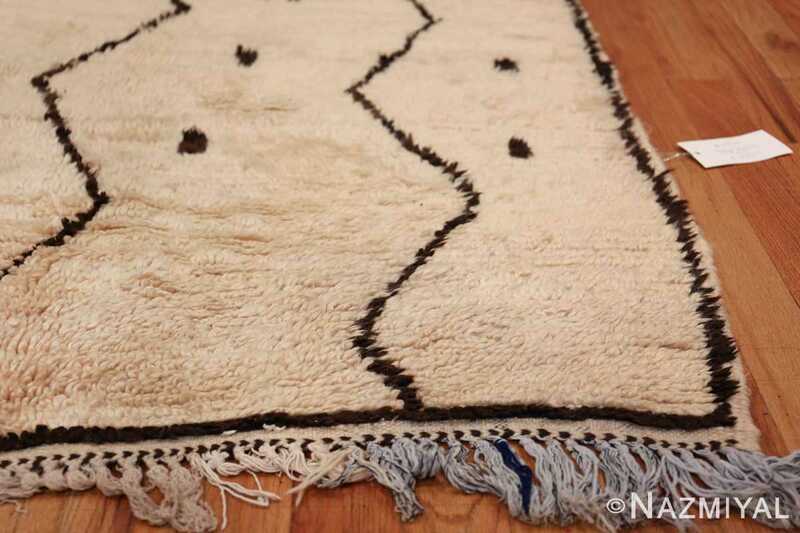 A subtle, more formal border defines and frames the main field of the shaggy Moroccan rug. The design itself consists of squares or rectangles spaced regularly between zigzag lines. It is broken by horizontal short zigzags in the middle. The design continues until the last line, which appears to be incomplete. 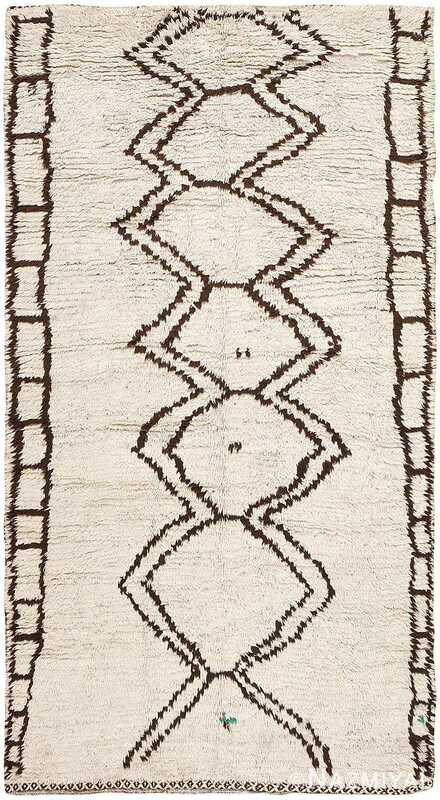 The design has rough vertical and horizontal symmetry, but it is not precisely oriented, adding to the hand-drawn quality of the piece. 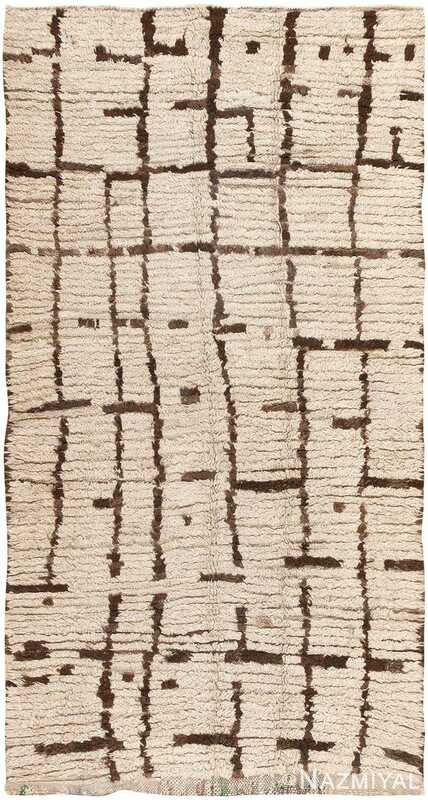 This small rug would make an excellent addition to any contemporary modern, Scandinavian, or minimalist interior design that needs an organic, primitive piece. It would also go well in any mid century retro interior design. This small vintage Moroccan Beni Ourain rug offers many unique create possibilities. 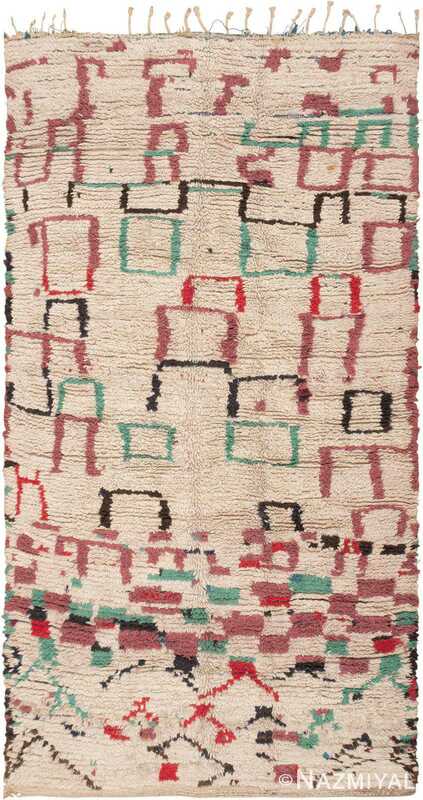 This comely mic-century Berber rug, designed by the Beni Ourain of Morocco, is a gorgeous and representative tribal composition. 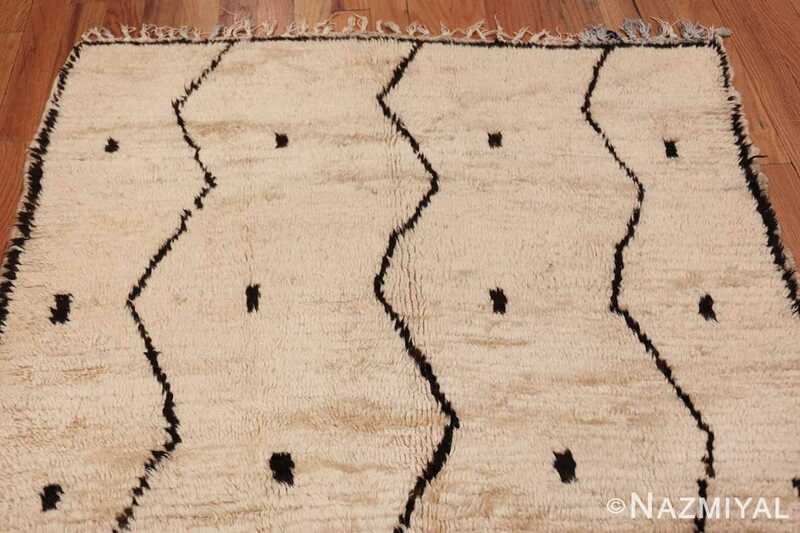 Strong linear motifs paired with bold broken segments decorate this spectacular vintage mid-century Moroccan rug while producing a magical visual illusion.